The Circular Ocean project has been invited to partake in the 2017/2018 Volvo Ocean Race, in the form of an exhibit signifying the prevalence of plastic pollution in our oceans, while seeking to inspire race-goers on the potential for new business opportunities in reusing, recycling and creating new products from discarded fishing nets and ropes. The Volvo Ocean Race 2017-18 will take the teams 45,000 nautical miles around the world, across 4 oceans, touching 6 continents and 12 landmark host cities. This edition of the race is particularly pertinent to Circular Ocean, as it has joined forces with UN Environment, which will see one of the Volvo Ocean 65 boats race under the campaign name of ‘Turn the Tide on Plastic’, drawing attention to the growing menace of plastic waste in the world’s oceans. Six of the host cities will also host Ocean Summits, bringing together political, business and science leaders to seek solutions to marine pollution. Since the Circular Ocean Projects inception, Irish Partners and Cork County Council Initiative “Macroom E” have carefully curated a selection of products created by eco-conscious companies around the globe from recycled fishing net materials. To date, the exhibit has featured at national and international events, providing a tangible basis for discussion around building green enterprises from end of life materials and moving towards a more circular economy. It was through attendance at one such event, that Circular Ocean came to the attention of biologist and Kerry native Lucy Hunt who had been appointed Sustainability Education Manager by Volvo Ocean Race. The Circular Ocean exhibit began its Volvo journey in Lisbon and is due to open in at the race village in Cape Town on November 24th, before following the course of the race to Melbourne, Hong Kong, Guangzhou, Hong Kong, Auckland, Itajai, Newport, Cardiff, Gothenburg and The Hague, expecting an audience of over 3 million visitors! Funded under the ERDF Interreg VB Northern Periphery and Arctic (NPA) Programme, Circular Ocean offers free consultancy for start-ups and small and medium-sized companies (SMEs) to support the development of eco-innovative products, technologies and services derived from waste fishing nets, ropes and components. The project is also undertaking various streams of research into the potential applications of nets in areas such as wastewater treatment, 3D printing and as a reinforcement material in the construction sector. 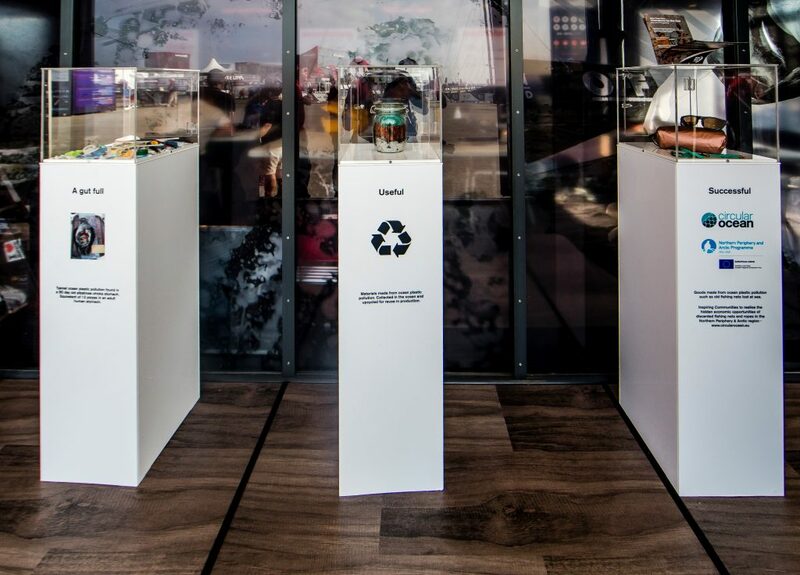 The Volvo Ocean Race provides a unique platform for Circular Ocean to help inspire communities to uncover the economic opportunities hidden in these end of life materials.